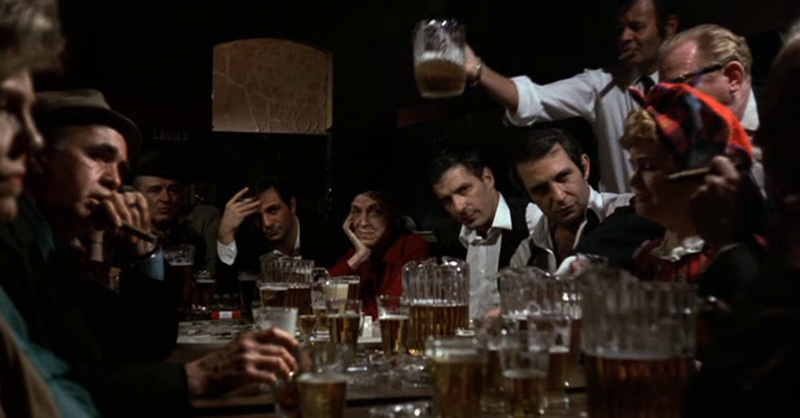 Eight drunk men and a dozen drunk women sing songs in a bar after a funeral. The youngest of the drunks around the long table littered with pitchers of beer are three friends who, with drunken enthusiasm, encourage the old men and women to sing. “Ladies first,” says one of the men, throwing a finger at her and biting down on his cigarette like he was calling in his secretary. Her voice shrivels and with each verse, the men and women smile around the table. They might be compensating for her bad singing, but maybe they genuinely enjoy her song. Or maybe they are mocking her. The men drink more beer with their neckties hanging down. As the woman sings, one of the men leans over to his friend and whispers something. They push each other away and laugh—some inaudible joke. These friends aren’t afraid to get close to one another. They lean on each other’s laps, leaning into torsos and smiling. Some women are laughing and some are stone faced. The applause dies down and one of the men’s ridiculous laughs is still audible. He’s so out of breath that he can only push out this hyena “hee-hee” that, in turn, only makes the rest of the table laugh. That’s all John sings. There is dead silence around the table. People look angry. When John Cassavetes wrote the screenplay for Husbands, it looked very different from my excerpt above. The screenplay was translated from about 400 pages of notes. He knew he wanted the film to show characters desperate to live. He wanted to show three fearful and vulnerable men brought together by the premature death of their fourth friend. The characters are people in need, who relate to all of us, as an audience. The plot didn’t matter. Cassavetes was about the moment, the feeling. Not the twists and turns. Cassavetes is known for his unique directing style. His screenplay, which was adapted from piles of notebooks, had guidelines, but also lenience for improvisation. He ad-libbed scenes with his actors and just started rolling the camera—a directing technique known today as “direct action cinema.” Cassavetes captured what few filmmakers have captured in cinema—he let the actors show their true selves rather than forcing them to embody fictionalized characters. As a director creating his own work of art, Cassavetes realized that the constituents of his art had lives of their own, and that the most convincing performances would arise from the actor’s freedom to act… well… freely and honestly. Cassavetes’s films have the energy of stage plays without the inhibitions that might arise in actors with live audiences. Don’t most filmmakers operate this way? Not really. Not mostly. Not at all, actually. Most screenplays that make it to the multiplexes follow a script that isn’t supposed to change. Ironically, the most famous movie lines are ones that were made up on the spot—“You’re gonna need a bigger boat” from Jaws or “You talkin’ to me?” Taxi Driver, to name a few. But there are other directors using this “direct action” style that Cassavetes was so renowned for. Mike Leigh made a film in 2014 about J. M. W. Turner, a famous British painter, by hanging out with his cast for a month before writing the script. But we must face the fact that our top picks on Netflix follow a script and story that try to take us away from reality and into a fantasy world that teaches us nothing about ourselves.. I enjoy pirates as well. 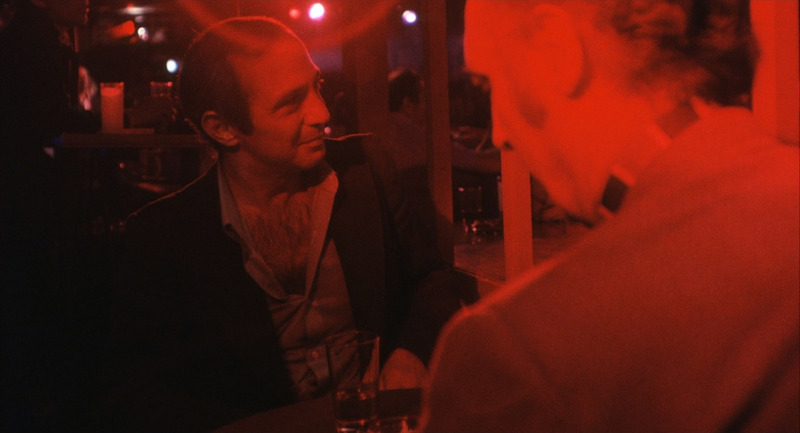 As for the description of John Cassavetes’s The Killing of a Chinese Bookie, “A strip-club owner has to repay his debt to the mob. The mafia offers him a chance to repay them by killing a man.” That description sounds just as enticing as pirates overseas or hot-air balloon rides. But Cassavetes isn’t on instant Netflix. I’m not sure he ever will be. To his fault or fortune, Cassavetes didn’t want to pander to his audiences with explosions and canon balls. He wanted to tell the story of people like you-and-me kind of people — not pirates and secret agents with plastic egos and their Hollywood definitions of love, hate, anger, longing and sentiment. You-and-me kind of people are not confined to Netflix genres and Oscar adjectives. There is so much more to take from a film than just a few hours of escapism. At least, that’s what Cassavetes would say. Just by living, we’ve had enough experience to shoot several movies. From our modest adventures in life, we’ve all developed different definitions for big words like “love,” “fear,” and “sentiment.” John Cassavetes was after you—not the character you were told to become. While films have become modes of escapism when we curl up in bed, our laptops heating our pillows, our personal stories are being suppressed by Hollywood frivolity, among other simple pleasures. The pleasure isn’t the issue — it’s the notion that movies are an art form for high production bureaucrats out of L.A. It might be unfair to compare “underground” filmmakers like John Cassavetes to outlandish, blockbuster films like Pirates of the Caribbean. They inhabit different worlds—different genres. But why do those genres have to be so estranged from each other? Shouldn’t the sadness of drunks around a table singing songs be a Netflix “top pick” too? Why aren’t true, honest, personal, low-budget films popular? Cassavetes wasn’t trying to be “underground” or too cool for pop culture. His films could and should be Netflix top picks, because then we would be inspired to tell our own tales—our own moments in time that matter much, much more than the plot line to the new Teenage Mutant Ninja Turtles — which, despite poor public feedback, made enough money for a sequel. When Cassavetes brought his first cut of Husbands to Columbia University, he had slipped in a number of funny scenes to tickle the film distributors. When they agreed to distribute the film, he took out the comedy and made it the intense movie we have today. This was in the ’70s, but that story is still relevant to how art must fight the glib and illusionary powers that the industry deems art. In an interview about his 1977 film, Opening Night, Cassavetes said that he thought the audience for the film was a character in the picture itself. “And I’m telling you,” he says with his finger drawn out, “[the audience] is not going to see something stupid. They’re going to see something that challenges their own intelligence and awakens their own emotions. … Everybody should see this movie.” He gets fired up, and he flicks his finger around at the invisible corporations who have suffocated the people’s emotions for the sake of financial success. Film has the chance to convey feelings and to leave us with thoughts. It’s as simple as that—but somehow we’ve neglected these evocative films for Seinfeld reruns. If Seinfeld inspires you, keep watching it. Otherwise (and I assume this “otherwise” is loaded), pick up a John Cassavetes film. See if the rawness speaks to you at all. If you don’t like them, just remember that Cassavetes is a filmmaker for the people and not for a film industry that has routinely taken freedom away from the artist and us, as individuals, who are all capable of expressing ourselves and being proud of it. Tags: Nighttrain Schickele. Bookmark the permalink.